Saruman's tower was equally impressive! Sometimes, I come across a product that is really good, but due to the lack of interactivity, it is also a very hard to review in any interesting way. It is certainly the case with BESTEK 8 Way Surge Protected Tower. Instead of the typical review (which would end in a single sentence ‘you can plug a socket or USB and it works’ ), I thought I would share a story instead. A brilliant idea to fill in these 300+ words needed for the perfect SEO. USE: ZY3FFGC8 to lower the price to $30.99! I had to upgrade my network, as I run out of Ethernet ports. Getting an unmanaged switch sounded great in theory, but when it came to practice, I had no spare sockets to power it on. 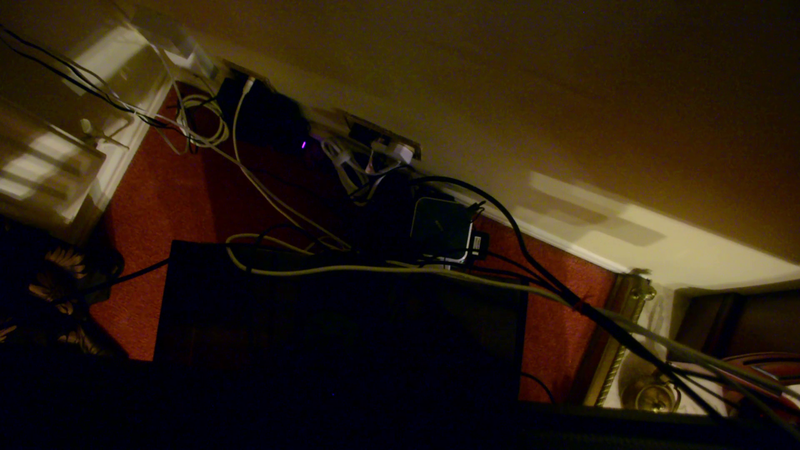 All these media devices, Raspberry Pi’s and Fingboxes needed the power and I was entering the fire hazard territory connecting an extension lead to another via a power splitting cube. There were I and yet another power plug to find the space for. I sat on the floor regretting my life choices, debating the first world problems and shopping for power strips. In the UK, this is a dreadfully boring and expensive experience. Discouraged by the prices in the local DIY store (I’m looking at you B&Q and the cheap plastic sold at the price of gold) I checked the Facebook, then my email. Alex, rep from BESTEK emailed me asking if I’m interested in taking a look at 8 gang +6 USB monster! A few days later, the BESTEK 8 Way Surge Protected Tower has arrived and I sat down to figure out the cable mess. 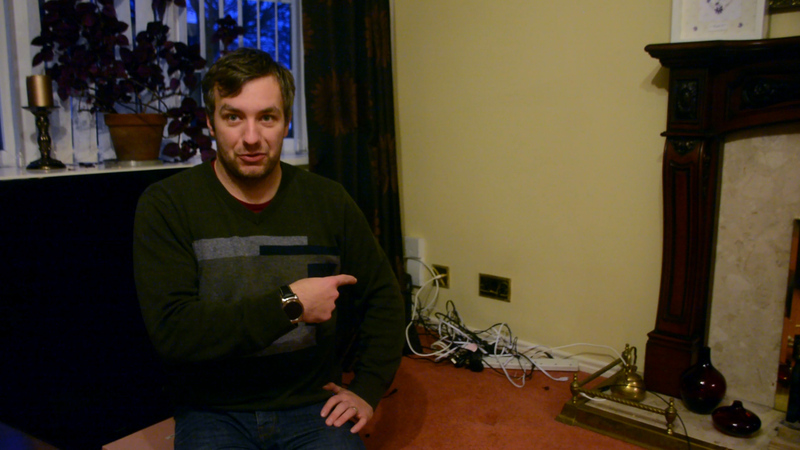 Please don’t laugh at me, I know I really need a proper TV stand – the one I have is a disgrace. This is also where the 6 USB ports come to play. 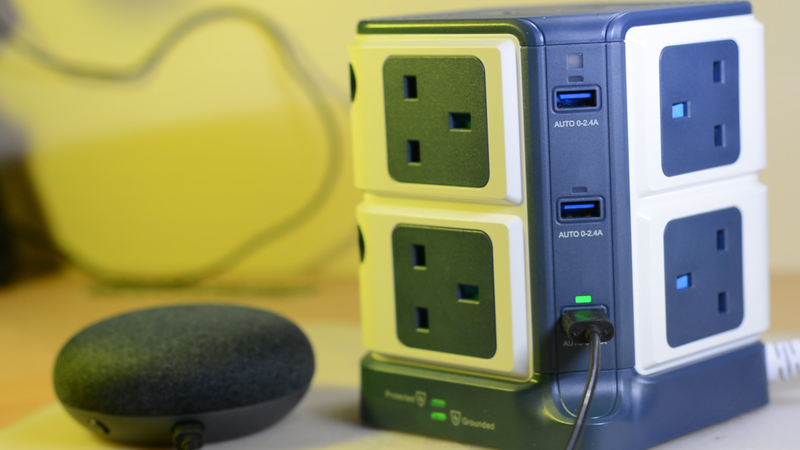 Raspberry Pi NodeRED and Fingbox will get their power directly from the USB ports. This will save me a lot of trouble with charges. The ports are rated 2.4A each with 40W/8A limit (whichever is lower). I’m pleased to say that everything is powered up. A bit of clever management allowed me to take advantage of the fact that BESTEK 8 Way Surge Protected Tower comes with 2 power buttons. One per level. I can power down my media devices completely without turning off the network equipment. The USB ports are charging regardless of the power switches states. BESTEK 8 Way Surge Protected Tower is a life saver! It’s solid, without being too big or heavy. The only constructive criticism I have is very UK specific. I wish I could turn the sockets around to position it to my liking. It’s priced well, making it a very attractive choice on the UK market. The BESTEK 8 Way Surge Protected Tower has been provided to me for the purpose of the review. As usual, with all my reviews I reserve the right to an honest critique of the product.